The Pelamis wave farm has just been officially launched after a delay of more than a year. 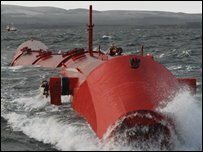 Pelamis takes its name from an ancient word for sea snake, as the machines could be described as giant metal snakes floating in the water. At full production they will be able to generate enough power for 1,500 homes, with 25 more machines set to be installed in Portugal.